To start with, as he frequently did, Carr included most of the major award winners. 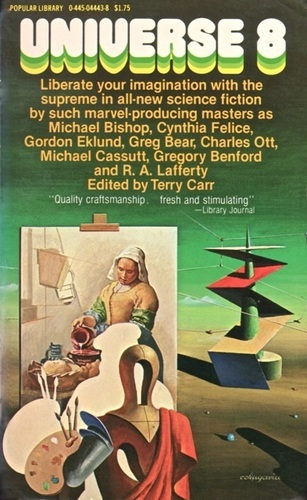 In this case John Varley’s classic “The Persistence of Vision,” which swept the Hugo, Nebula and Locus Awards for Best Novella. 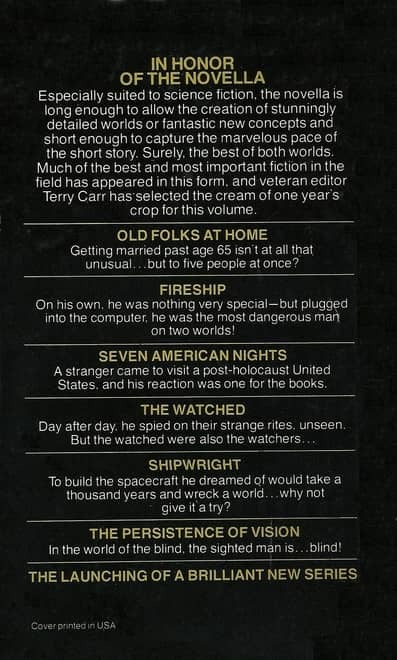 He also included three additional Hugo nominees (the Wolfe, Vinge, and Prest) and two Nebula nominees (Wolfe and Vinge). 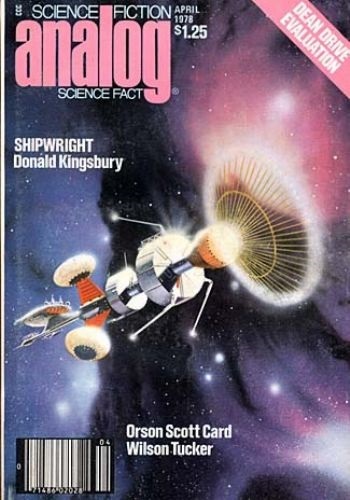 Donald Kingsbury’s “Shipwright” is set in the universe of his Hugo-nominated novel Courtship Rite, and Michael Bishop’s tale is part of his ambitious Urban Nucleus story cycle. Christopher Priest’s “The Watched” is part of his Dream Archipelago sequence. For our vintage magazine readers in the audience, all these award winners add a bit of extra spice to your collecting. 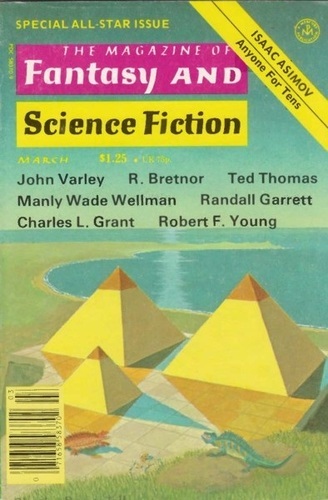 Here’s a look at a few of the magazines and anthologies these stories originally appeared in (click for bigger versions). Good hunting. 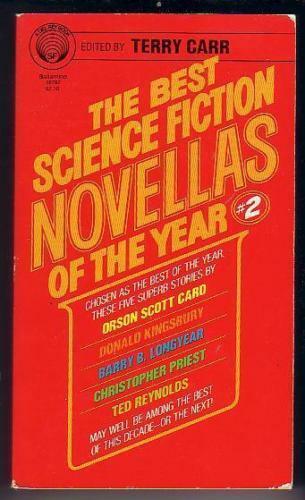 I bought The Best Science Fiction Novellas of the Year 1 as part of an eBay lot of 17 Del Rey paperbacks in great condition for just $9. Here’s a look at the whole set. At about 50 cents per book, this is one of the better bargains I’ve found online recently. 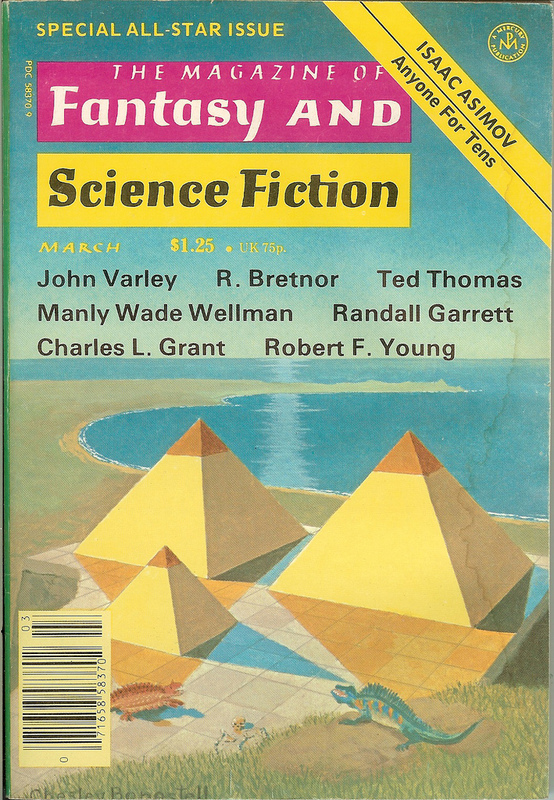 The five Best of… volumes alone (Eric Frank Russell, Stanley Weinbaum, Fritz Leiber. 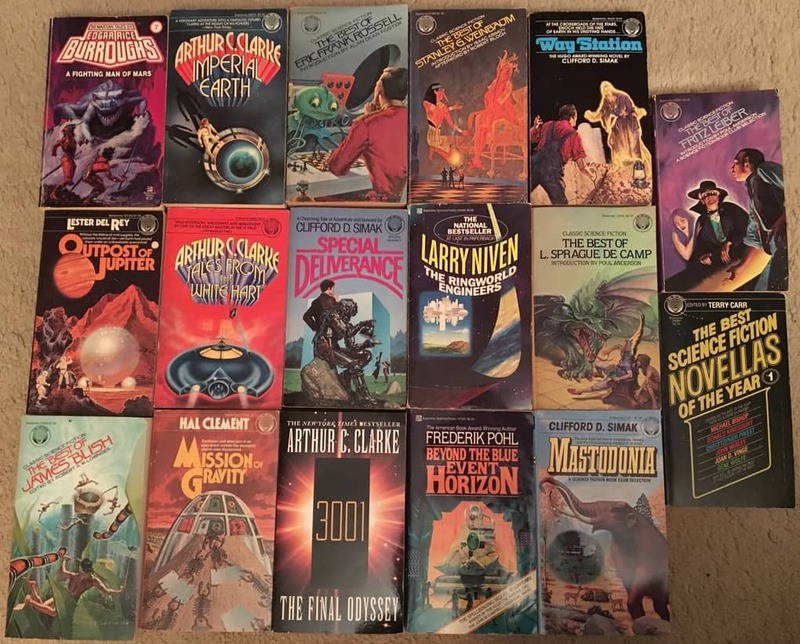 L. Sprague de Camp, and James Blish) were easily worth nine bucks. This is a collection of great books that will keep me busy for a long time. 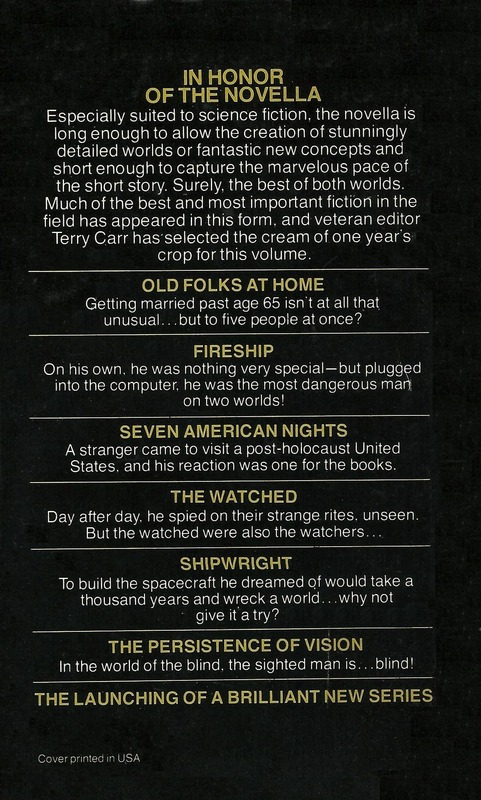 Carr produced one more volume of Year’s Best Novellas and, if anything, the TOC was even more impressive. 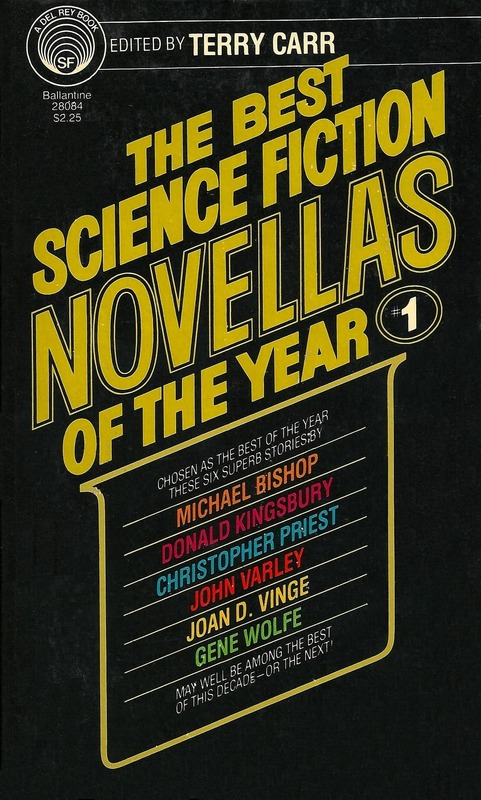 It included Barry B. Longyear’s multiple award-winner “Enemy Mine,” (made into a very solid move starring Dennis Quaid and Louis Gossett, Jr. in 1985), Donald Kingsbury’s “The Moon Goddess and the Son” (which became a novel with the same name in 1986), Orson Scott Card’s brilliant “Songhouse,” (which formed the core of one of his best novels, Songmaster, in 1980), and more. Check out all our coverage here. 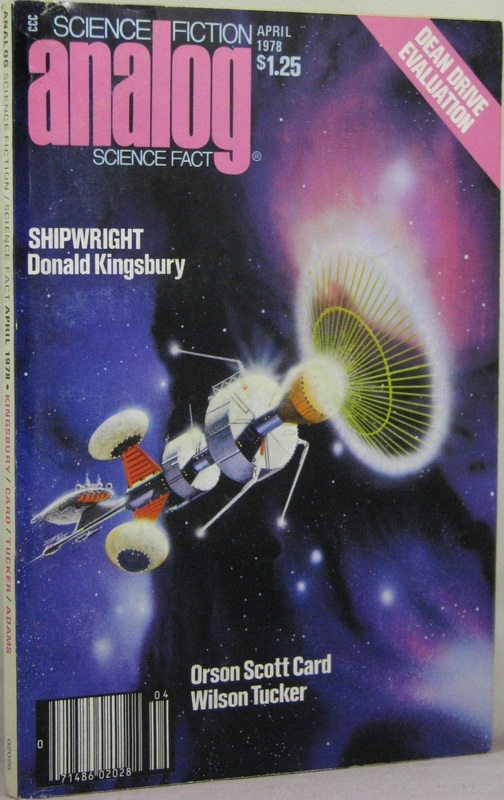 The Best Science Fiction Novellas of the Year 1 was published by Del Rey in September 1979. It is 335 pages, priced at $2.25. 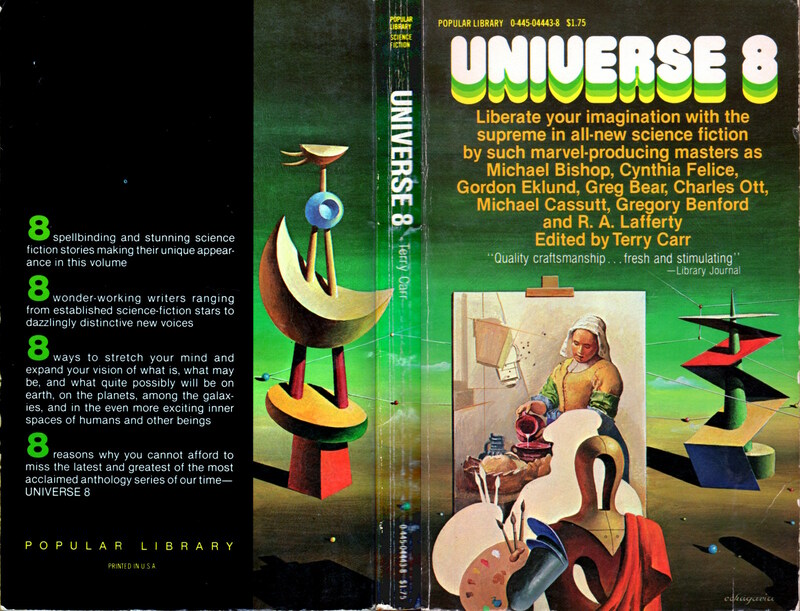 It has never been reprinted. That first book is great, with only the overrated Varley story looking like a disappointment to me from this remove. (And he could hardly have skipped it, it got such acclamation.) The second book is weaker. Interesting that the two writers with two stories are Priest and Kingsbury. Good choices, really, and Priest in particular is important and underrated in this country, IMO. I agree completely that the Varley is overrated. I didn’t think much of it when I read it in 1979, and I doubt it’s aged well. But this was the era when Charlie Brown at Locus was loudly proclaiming John Varley as “The real deal,” and his star was rapidly ascending, so I wasn’t too surprised when he swept the Awards. Oddly enough, the story I really want to re-read after all these years is “Enemy Mine” (probably because I have fond memories of the B-movie version, which I saw with a group of friends in ’85 and enjoyed the heck out of). So maybe I’ll enjoy Book 2 more than you did.